The recent career of Mel Gibson has seen him appear in one movie per year since 2010 (with the exception of 2015). While personal troubles have dogged him over the last ten years, and caused him no end of embarrassment – and given Ricky Gervais the opportunity to make one of the best jokes about an actor, ever – Gibson has tended to stick to the action genre that has stood him in such good stead in the past. Aside from his role in The Beaver (2011), Gibson’s choice of roles has seen him engage fitfully with the material on offer, and he’s been the villain in two action sequels that should have been much, much better: Machete Kills (2013) and The Expendables 3 (2014). 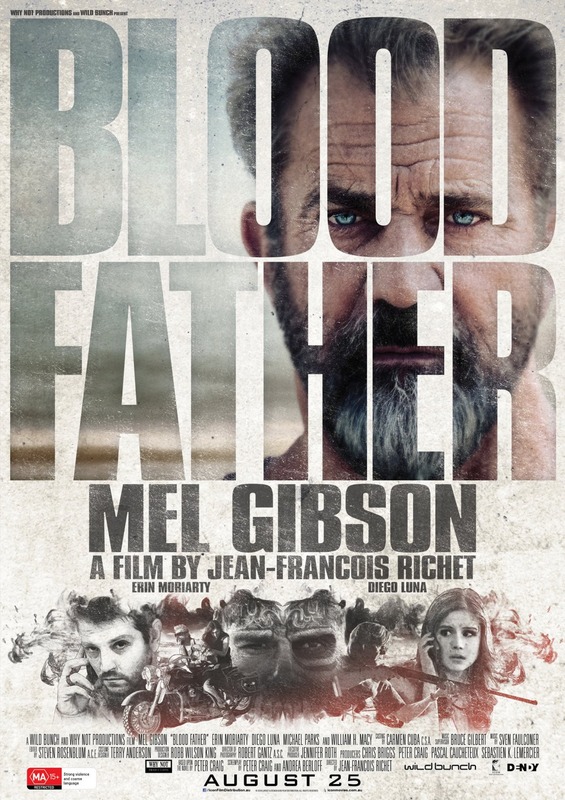 But now, with Blood Father, Gibson finally has a role he can really sink his teeth into, and the result is a performance that serves as a (much-needed) reminder of just how good an actor he really is. An adaptation of the novel by Peter Craig, and co-written by Craig and Andrea Berloff, the blood father of the title is an ex-con by the name of John Link. He’s been out of the joint for a year, and sober for two. He lives in a trailer outside a small town in New Mexico, and is a tattooist by trade. He’s also divorced, and has a seventeen year old daughter, Lydia (Moriarty). But Lydia has been missing for the last three years, ever since she ran away from the home she shared with her mother and her mother’s third husband. John has hopes of finding her one day, but without any clues as to her whereabouts, it’s unlikely he will. It’s Lydia who finds him. Having gotten involved with a junior member of a Mexican cartel, Jonah Pincerna (Luna), Lydia finds herself in very deep trouble when Jonah raids the home of someone who’s been stealing from him. As a test of her loyalty he asks her to kill the woman there; Lydia ends up shooting Jonah instead. On the run, and with no one else she can call, Lydia contacts John and he arranges to meet her. He takes Lydia back to his trailer, but it’s not long before Jonah’s crew turn up looking for her. The ensuing gunfight prompts John to leave and take Lydia with him, and to find out more about Jonah and his connections. After a lucky escape from the police, John discovers that the cartel have sent a hitman (Trujillo) to kill Lydia. Fans of Mel Gibson the actor will be glad to see that his performance in Blood Father is very definitely a return to form. Ostracised and pilloried for the racist remarks he’s made in the past, Gibson seemed to be getting by on the goodwill of others – Jodie Foster, Robert Rodriguez, Sylvester Stallone etc. – and while he’s still a highly watchable actor in his own right, there was always a feeling over the last few years that Gibson wasn’t trying too hard, that the work he was taking on couldn’t have been challenging for him, and so he wouldn’t rise to the challenge. Here, though, Gibson has found a role that is not only challenging, but inspiring, rewarding, and above all, one of the best fits for his skills as an actor. Inevitably, there’s more than a smidgeon of Martin Riggs lurking inside the character’s DNA. Witness John’s response to the arrival of Jonah’s henchmen and the gunfight that follows: he’s dismissive of them, and once they open fire and he has to deal with them he gives angry voice to the variety of ways that their appearance will lead to his breaking parole. He’s pissed off, he’s mostly unconcerned by their firepower, and he can’t wait around for the police – the sensible thing to do – because he’s convinced they won’t believe a word he says. Playing John with a fatalism that speaks volumes for the character’s mindset, Gibson gives one of the best performances of his entire career, and proves as mesmeric an actor as he was back in the late Eighties, early Nineties. As he scowls and growls his way through the movie, Gibson also imbues John with a subtle vulnerability that adds depth to the character and makes his need to reconnect with Lydia entirely credible. 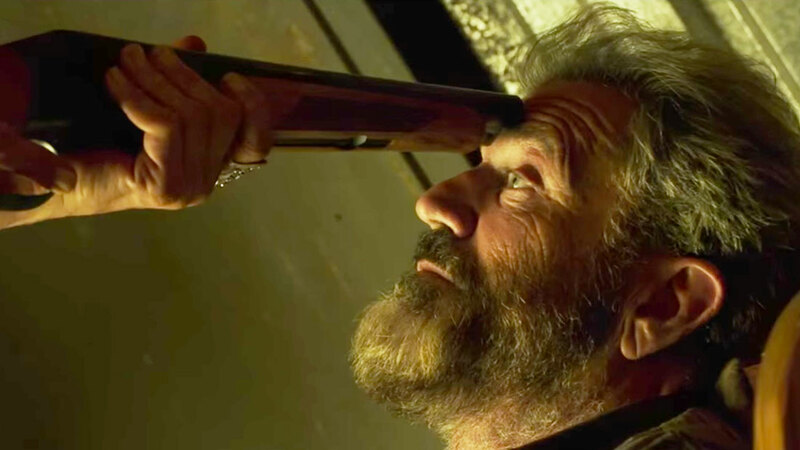 Thanks to the combination of Gibson’s performance, Craig and Berloff’s astringent screenplay, and Richet’s sharp, purposeful direction, Blood Father is more than just a standard action drama punctuated by brief, kinetic bursts of violence. It has an off-centre sense of humour, is sure-footed enough to keep John and Lydia’s relationship free from sentiment, makes very good use indeed of its stunning New Mexico locations (beautifully lensed by DoP Robert Gantz), and above all, maintains a level of tension that many other so-called thrillers fail to achieve for even a fraction of the movie’s running time. As a return to form, Gibson couldn’t have picked a better vehicle or character, and the movie is proof positive that he’s still as mercurial an actor as ever, and that when the right role comes along, he’s nigh-on untouchable. Rating: 8/10 – with deft supporting turns from the likes of Sandoval and Macy allied to Moriarty’s low-key, sympathetic portrayal of Lydia, Blood Father is more than just a vigorous action thriller; despite its awkward title, the movie explores themes of loss and regret, hope and sacrifice, that elevate the narrative beyond its basic, conventional set-up and make it one of the more astute “relationship dramas” out there.